Diabetes is the leading cause of blindness in the United States for patients age 20 to 74. Diabetes can affect vision in a variety of ways. Vision loss occurs commonly from two major problems proliferative diabetic retinopathy and macular edema. Both are treatable with laser if detected early, but laser treatments may also create additional vision problems for the diabetic. Visually impaired diabetics have specific needs to be addresses in the low vision examination. Diabetics must see to fill insulin syringes or take oral medications. Diabetics need to see to test their blood sugar. Diabetics need to read labels on food containers to control their intake of carbohydrates. Diabetics may have neuropathies affecting their feet. If the patient is unable to see his or her feet, other care by their physician, podiatrist or family may be needed to monitor the health of their feet. Glare and loss of contrast sensitivity need to be addressed. Diabetics often experience fluctuations in their vision related to changes in nearsightedness or farsightedness caused by ups and downs in their blood sugar. As blood sugar changes, the shape of the human crystalline lens changes. Before prescribing eyeglasses for a diabetic patient, doctors frequently retest the patient on another day to test for these fluctuations. Macular edema is a swelling of the delicate macular tissue in the center of the retina. It does not cause total vision loss but causes a loss of visual acuity. Macular edema can be treated with laser if identified in the early stages. Your optometrist or ophthalmologist can detect this swelling through a dilated retinal examination using a microscope and special lenses. Laser can reduce vision loss if caught in time. Proliferative Diabetic retinopathy is the more dangerous condition. It has the potential to cause profound vision loss by damaging the small blood vessels of the retina. Then chemicals are released from the retina that cause abnormal blood vessels to grow. These blood vessels break and bleed creating scar tissue within the eye. As the scar tissue contracts, it may pull on the retina leading to a retinal detachment. Laser treatment can reduce the risk of severe vision loss by 50%. Color vision may be mildly affected along the yellow-blue axis. This allows them to accept the yellow and amber lenses often required to improve contrast after laser, without being bothered by the degree of the yellow color. Laser treatment is crucial in saving the sight of many diabetics. Laser, however, causes other visual problems that should be addressed by the low vision specialist. Pan-retinal laser treatments require hundreds of laser burns across the peripheral retina. By lasering these peripheral areas, more oxygen is available to the supply the crucial center of the retina, where our sharpest vision exists. Unfortunately, some side vision must be sacrificed to save the center vision. Loss of Contrast Sensitivity and Glare ProblemsPatients often describe a “hazy-glare” after laser surgery. Contrast sensitivity, the ability to judge subtle differences in images like seeing a gray object on a dark gray background decreases. Our world is one of subtle contrasts. We use contrast sensitivity to see faces or find a dark object on a darker background. Amber filters like the Corning CPF series reduce the glare and may aid contrast. The peripheral retina contains more of or rod cells that we use to see at night. Thus in lasering the peripheral retina we lose more rod cells that we need to see with at night. Night driving may become more difficult do to loss of the rod cells. At night clear eyeglass lenses may be required. If extensive laser has been performed, night driving may become dangerous. Milder forms of laser called focal laser, may increase glare but have less effect on side and night vision. 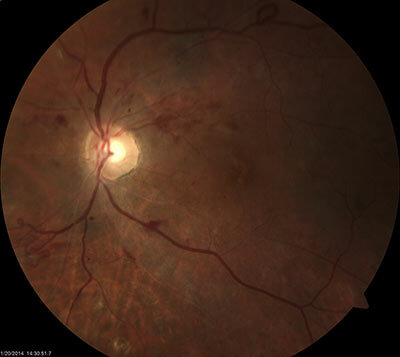 Abnormal blood vessels may also grow into the front portion of the eye causing a severe painful glaucoma. This form of glaucoma can be prevented by timely laser treatment of the retina but once established is very difficult to control. It may lead to profound vision loss. Diabetics develop cataracts at an earlier age in adults and cataract may even occur in children. The juvenile form of cataract may be reversible with better control of blood sugar. Cataracts may cause a foggy clouding of vision. An occasional complication is double vision caused by ocular motor paralysis. It often resolves over several months. At the first sign of double vision, see your eye practitioner immediately. The key to diabetic vision loss is to prevent it through early detection and treatment. Diabetes can cause a vast range of vision problems. Once vision loss occurs, the low vision specialist can aid the diabetic deal with many of these problems.